DownThemAll is all you can desire from a download manager: it features an advanced accelerator that increases speed up to 400% and it allows you to pause and resume downloads at any time. You can easily access DownThemAll from the context menu, by right-clicking on any webpage, from ‘tools menu’, or simply by adding our cute handy icons to your toolbar. The dTa ‘Select links’ window lists every single link, image or embed object contained in a webpage. This is a dream if you need to download a large amount of files in just a few seconds: simply select the files you need and you’ll be ready to start. dTaOneClick downloads the files of a page using the last filters and the last renaming mask you set. So, if you are surfing the web downloading mp3s or pictures, for example, you’ll just have to find the page you want and to click on dTaOneClick… and all your downloads will start. No need to select them first. Selecting the files you want to download can be even faster, once you’ve set your personal inclusive filters. In this case you’ll just have to select the filter you want to apply, and all the files matching your criteria will be automatically downloaded. All filters are configurable from dTa ‘preferences’ window and can include wildcards [’*’, ’?’] as well as regular expressions. There is also a live-filter that allows you to refine your selection dynamically! All files downloaded by dTa can be easily auto-renamed according to your personal needs. There are plenty of tags you can use to build destination filenames and directories, including: date and time of download, website URL, link description and many more! 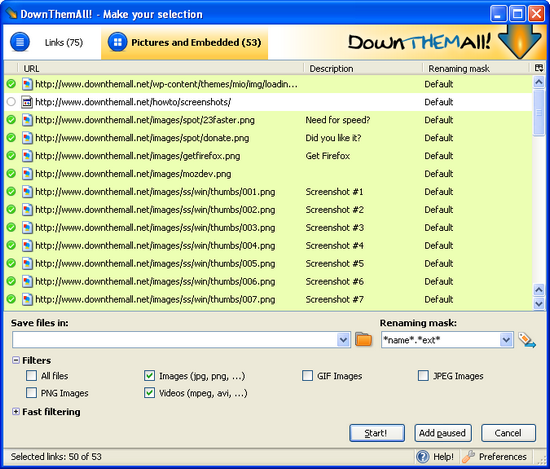 DownThemAll features a smart download technique called ‘multipart download’. It splits files into multiple sections, which are downloaded simultaneously. This maximized use of bandwidth increases average download speed up to 400%. You can manually add or remove sections whenever you want during the download, and you can choose the maximum number of chunks every file is split into. DownThemAll can pause and restart downloads at any time, without losing data. You can move your files up and down in the queue in order to give them a priority order. * In case a file already exists, you can choose whether your downloads have to be renamed, overwritten or aborted just by setting a default behavior. * You can customize time-out interval, as well as the maximum number of simultaneous downloads. * Customize notifications, choosing between Firefox sidebox alerts, alert boxes, or simply nothing at all. * If you want it, dTa can close the source tab when the download starts. * You can choose to close dTa automatically when all downloads are completed.